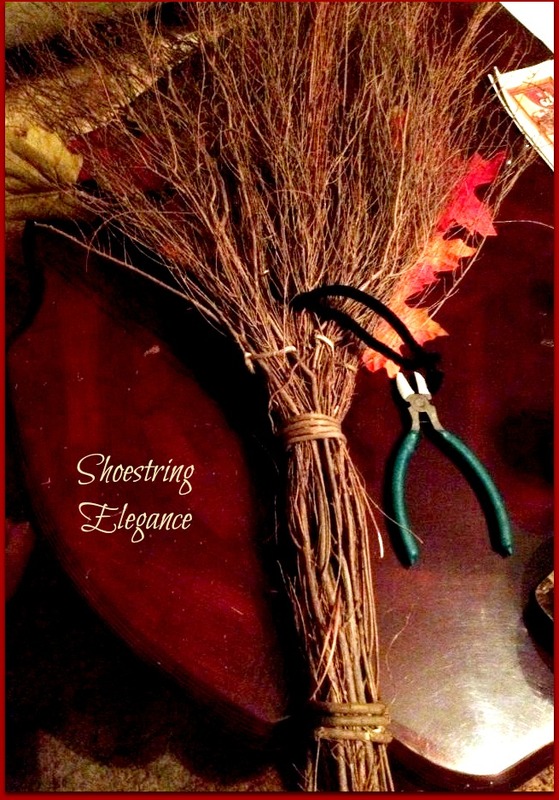 Shoestring Elegance: Welcoming Autumn & It's Not A Wreath! Welcoming Autumn & It's Not A Wreath! Happy Autumn!! Well, it will be, actually, Autumn, the day after tomorrow, for those of us, here in the United States. I think I long for this Season all year long! The beginning of cooler days and nights, blankets, baking, sweaters and, of course, Lots of decorating!! 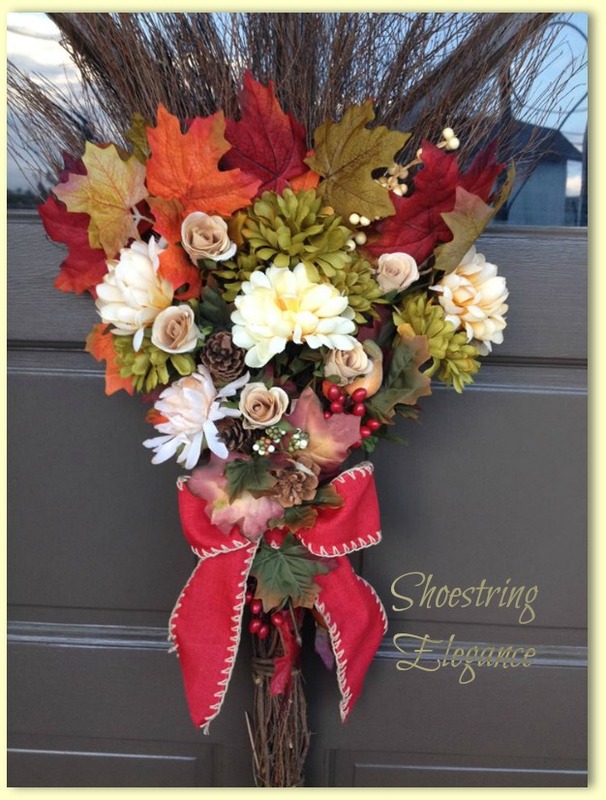 Fall seems to be the kick off for all the wonderful celebrations ahead. What can I say, I'm a sucker for traditions. Even if they're new ones. Which kinda brings me to this post. 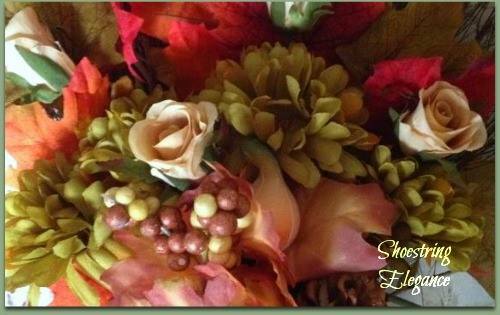 I have welcomed Autumn for the past 2+ years by sharing with you my Autumn Wreaths. I have loved every one of them. Here's the teaser I posted on Shoestring's Facebook page. 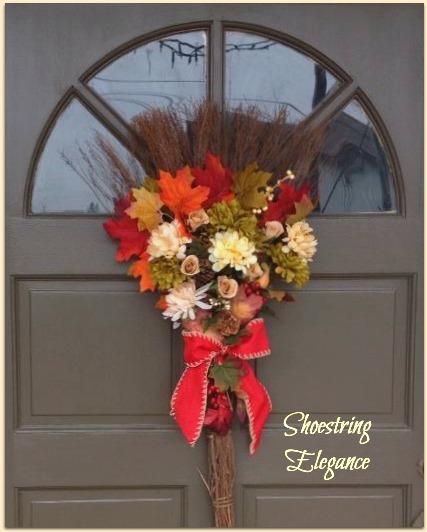 This year, however, I was drawn to decorate my front door in a different way to 'Welcome the Fall Season' in. Ready.....?? It's a broom! Well, not a broom you could sweep with, but just the same a broom! I love it. I haven't seen many others and thought it would be a wonderful change and a thrifty way of using all my old and still beautiful blooms and leaves (with a few new ones). If you don't know me, I'm all about less cost, for the highest beauty. So here it is! What do you think? This wonderful broom, that serves as the base for this door hanging, was all of $2.99 @ Michael's & I got 50% off, so, yeah, a buck fifty! 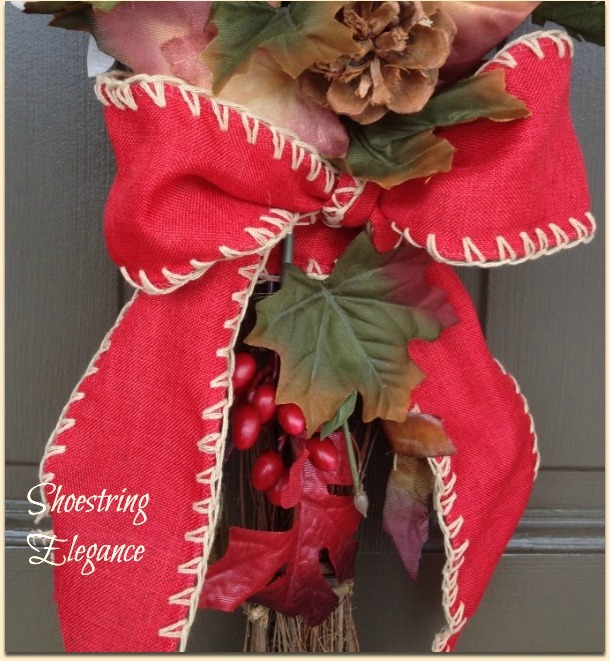 I did by one new group of stems that were regularly $6.99 but they were 60% off, and this awesome Red edge-stitched cloth ribbon (for the bow), that was also 60% off of $6.99, I believe I can very easily say that in all total, this Autumn Door Decor still came in under the $10 mark! After removing the tags, It was just as easy as this. I attached my hanger to the back and then laid the foundation of Fall leaves down, attached them and then just added from there until I had what I was hoping for. Don't you just LOVE the stitching on the edge of the bow? As soon as I saw it, I knew this was exactly what I had been looking for. 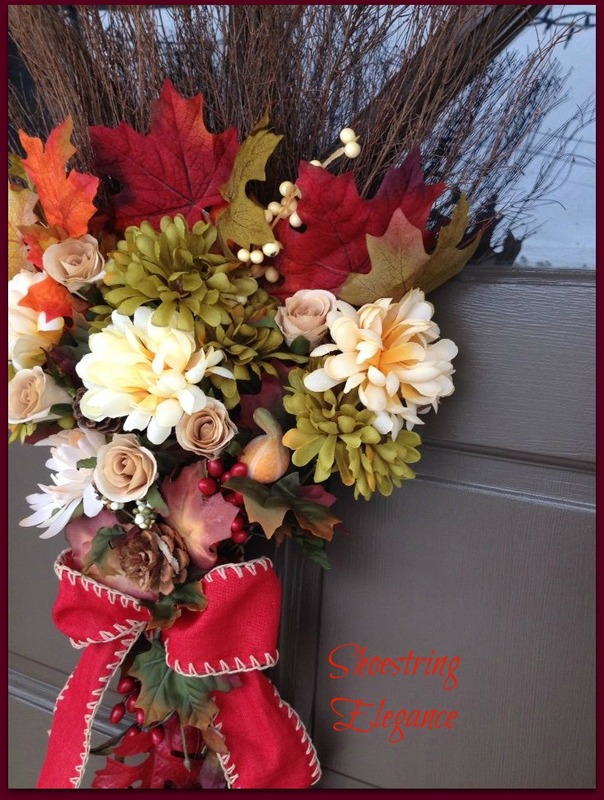 Here it is last night hanging on my open front door, while I was finishing up the final little "tweaking"
And..... here it is this morning, in all its glory hanging on my front door to greet all who enter. The day's weather here, in Northern California, is playing along with me, (for today, anyway) It is cool, the wind is blowing and really is beginning to feel like a Fall day!! I'm not looking at the forecasts anymore! 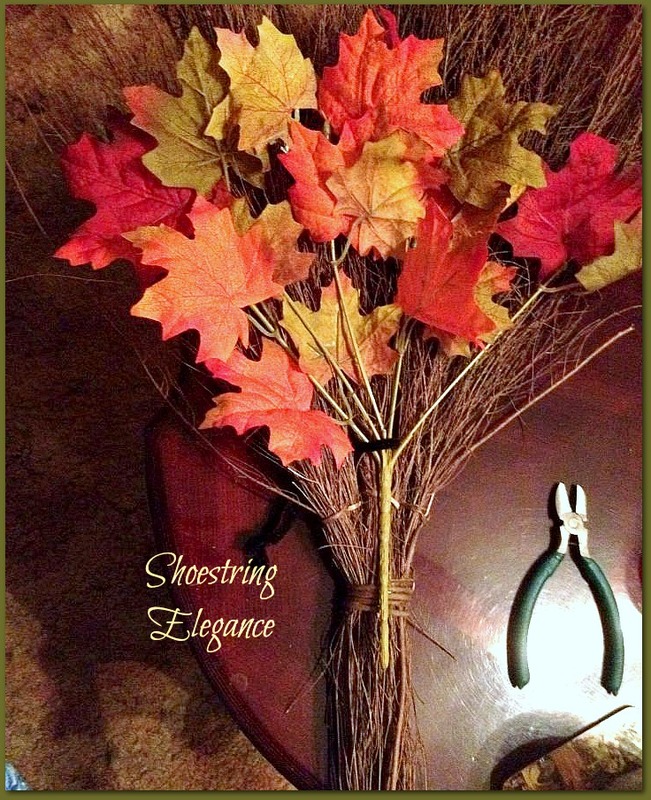 I hope you have found a fun way to welcome Autumn/Fall into your home. For yourself, and your guests! I always think it's a nice way to say, "You are welcome here" & "I even decorated for you!" Plus, it makes me smile! There really isn't a price tag for that! I hope this will Inspire some of you to embrace and welcome the Season, your friends & family, with some of the Beautiful colors of Fall! Many more colors of the season to come! Your front doors looks very pretty and welcoming. Happy Autumn to you too. Thank you so much, Janet! I so love decorating them! Thank you so very much, Linda! Thank you for your kind words! That's so pretty! I think the bow just makes it. Thanks, Stacey! I agree! I love this bow, too! So pretty. I think I'll give it a try too. Thank you for the inspiration. G'day! Marcia, Thank you so much for your kind words. Let me know how yours turns out, if you do one! G'day to you, as well! It's beautiful! Thanks for linking up to the Bloggers Brags Pinterest Party! I've pinned you post to the Bloggers Brags Pinterest Board. Oh, Tammy, Thank you so much! You are such a sweetie! Happy Autumn! It really is beautiful..great job Theresa. You really seem to be motivated and energized for fall already. I need some of that [energy]. Thanks so much, Jonell!! <3 I LOVE Fall..That the only motivation... Haha, Energy, not so much. I love that you popped by and left me some comment love! Just a Fun Saturday Morning Share!